At the latest Amazon shareholder update, Jeff Bezos took the time to explain how AI fits into Amazon’s plan to dominate retail. On the tech side, AI is taken for granted as a building for everything like Big Data, Cloud Computing and the internet before and tech leaders like Elon Musk, Zuckerberg and Larry Page all engaging in philosophical-level discussions about what is AI and will it or won’t it kill us. Jeff Bezos, on the other hand, is known for taking each and every new technology, embed it and eventually harness it to sell more products online without dealing with semantics, high level ethics and so on. From Bezo’s quick explanation, Amazon is taking a vertical approach to AI and weaving it from the customer facing devices all the way down to the cloud infrastructure where such AI algorithms live and evolve. The front end includes front facing services such as Alexa, delivery drones and self-serve stores and to most customers, this is what AI really means and currently leaves most impression on the industry and customers. The middle layer is where most of the impact of AI actually happens today, it is in this layer where Amazon needs to help a customer predict the solution and problem the customer came to solve. It is in this layer where recommendations for additional and alternative products occurs. Currently, anyone shopping on Amazon quickly realizes that this layer lacks substance and this is where an true AI investment will yield most impact. The base layer is like the physical brain, this is where the AI code actually runs. This layer is also where the AI algorithms evolve and optimize. It seems that Amazon is going to apply its AWS strategy of “develop and use internally and sell externally” which will allow others to easily create smart stores and apps using Amazon. In theory, that would mean commoditization of the AI stack. However, in practice, AI, like Big Data has proven to be hard to penetrate without a very high specialization bar so skepticism is worth maintaining here. Colabo to showcase at Northside Festival’s NExT Expo! 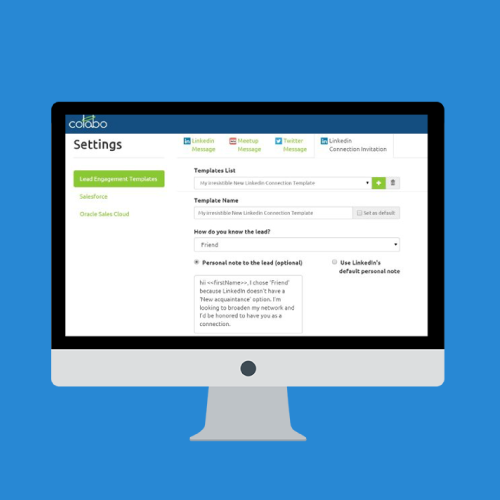 Introduction This case study shows how Colabo provided their solution for a US-based enterprise to establish and grow their sales in a new EU territory, and ultimately exceed their sales projections.